A couple of Sundays ago, one of our pastors, Kevin Hauman, made a statement when talking about families that struck a chord in me. He said, “We have to serve our families.” Sounds simple and common sense, but I have to admit, I never really equated what I do at home as serving. Not really. I cook, clean, keep laundry (except my man’s because he likes to do his own and I don’t argue ;)) up and groceries bought etc…It’s just, you know, what I do as mom. Not that my husband doesn’t do any of these things, he does them often and my kids help out. But for the most part, I do these things. I do them without much thought. It is a labor of love but I haven’t thought of it as that. Was I tired? Yes. Would I have to go all the way downstairs? Yes. Would I probably be wide awake the rest of the night? Probably. But He was right. And so I did. I went downstairs and came back up and brought him an ice pack which helped! Did I lay awake awhile? Yes. But it felt good to serve him out of love. To do that simple task. Like Mother Teresa said. It’s not how much we do, but how much love is behind it. What are some simple things you do for your family that you don’t have to, but want to in order to show them how much you love them and want to serve them? Forward Challenge: Do one thing for each of your immediate family members today that is small, but served with a lot of love. Note how it makes them feel and how it made you feel! Forward Prayer: Lord, it’s easy to serve our family when it’s things we enjoy doing, but sometimes cooking one more meal, dropping off forgotten books when we are already running late for meetings, or cleaning gooey gum off shoes doesn’t feel loving. Help us to do it anyway and to love like You would. Fill us with overwhelming love and let it shine through our actions. “How are we going to get in now? I told you we should have left sooner,” friend #1 said. “You can’t leave sooner if you don’t know any sooner that he’s here.” Friend #2 huffed, frustrated and pushed in by the crowd. “Well, I didn’t come all this way for nothing! We’ll mow every single man down. Women and children too; I don’t care!” Friend #3 wasn’t leaving either. They had a mission to accomplish. The heat licked at them and their pal only stayed quiet, but hope filled his eyes and that was enough for all of them to figure out a way, but their bickering continued. They paused and looked at him. He pointed up. The friends chuckled at their pal’s humor, though dark. If–no, when–they got him inside, he’d be doing more than feeling. He’d be walking. That day Jesus went to Capernaum and people found out he was there in a house, so immediately they came bringing those who needed healing. So many people packed in, they nearly closed in on Jesus! Have you ever been in a place like that? A concert? Black Friday? It’s claustrophobic for sure. These four friends brought their paralytic friend who was lying on a mat/stretcher. They had no plans to walk away without seeing him healed. But they were boxed in. In this passage, four things stand out to me. The paralytic man had a desperate need and he couldn’t fix the problem alone. Ever been there? Sometime we battle things, we struggle alone and we never ask our brothers and sisters in Christ for help. Maybe because we feel ashamed. Could be that we don’t think we should be having these struggles or problems and can’t admit we are (that’s pride by the way). We might even fear they’ll turn their backs on us, judge us critically, or gossip (those aren’t real friends). Whatever the reason, the first thing we must come to terms with is we need godly friends who have our backs. Who have our whole selves. Sometimes when we can’t do for ourselves, when we feel paralyzed, we need good and godly friends to carry us in prayer…or even physically like this account. In this case it was a throng of people packed in like sardines and getting to Jesus appeared bleak. Impossible. I know, and you may know, that Jesus is always here. But sometimes it feels like he’s far away. Our feelings don’t change the fact that he is indeed near. What this man needed was far away. Obstacles were keeping him at bay from his miracle. Sometimes, obstacles are so great that it feels easier to give up and walk away. To go back to the way it was before. Like the Israelites on their way to the Promised Land. It was hard. There were obstacles. And they began to romanticize slavery…hey we ate good. It wasn’t that bad. Yes it was! You cried out to God to be delivered it was so bad. But living in the familiar seems easier than forging ahead through obstacles and trouble to get free! These guys weren’t going to let the obstacles stand in their way. They thought outside the box. That little dialogue, of course, was fiction but I imagine they saw the crowds and human nature took over for at least a second. How are we going to get him to Jesus? It looks hopeless. I don’t see a way. And then a way was made! It wasn’t through the front door. Not even the back door. Many times we expect to get somewhere a certain way. When that way is blocked, we get discouraged. Think outside the box. Faith is believing in the unseen. What aren’t you seeing? You may need godly counsel/friends to help you see! Instead of going through, you may have to climb up. You may have to rip the tiles off the roof one at time and chip away until you can see the light! Freedom doesn’t always come freely. Overcoming sin and struggles won’t always come easily. It takes time. Perseverance. Endurance. Sweat. Blood. Tears. And having good friends to help rally around and fight with you is important! Break through is possible. All things are possible with God. But it takes faith. Keep going. Keep believing. Keep pressing in. Don’t let pride, fear, or shame hold you back from rallying good friends to go into battle with you and to carry you through prayer. Get up and walk, friend! Forward Challenge: Commit today to asking one friend to pray for you. Whether you need healing, you need to overcome a weight or hindrance that’s keeping you from running the race, or you need to battle through a sin for freedom. Swallow pride. Don’t cower in fear. Have courage. Forward Prayer: Lord, we trust You. We draw near to you today and confess we need healed, changed, transformed. Help us overcome fear and trust godly friends to pray for us. Meet us where we are. Give us strength to persevere and not give up when obstacles seem to keep us from where we need to be. At Your feet. In Jesus’ name. Amen. Hunting season is almost upon us, whether you agree with hunting or not. Men and women everywhere will camouflage themselves, creep into the woods and wait patiently for that deer. The key to hunting, besides being a good shot, is to be slow about your movements–tiptoeing…in the words of Elmer Fudd, “qwietly” as not to scare the animal away. They have to blend into the atmosphere so they aren’t spotted. If you’ve ever hunted, watched a show about hunting, or just walked in the woods, deer can detect you. They suddenly stop, raise their heads and freeze. They sense danger. Paul says in Galatians 5:9 (MSG), “…a little yeast…spreads through the whole batch of dough!” He’s talking about false teachings slipping in and jacking with what he taught–the true gospel. I think it’s important to keep yourself in the word and under godly teaching so this doesn’t happen, but that’s not what I want to focus on today. I think a lot of yeast (leaven in many translations) can slip into our lives in many ways. Sin can be subtle. Just a little dab. It’s quiet. It’s camouflaged. And it ruins us. Song of Solomon (Song of Songs–same book) says (2:15), “Catch us the foxes, the little foxes that spoil the vines…” If we were a vineyard, being tended to and bearing fruit…foxes would sneak in and ruin that tender, budding fruit. Little foxes can make big messes! Think about the big messes in your life? Did they all start out at tidal wave level? Maybe some. But more often than not, it was small. A little dab. A dash of this and a sprinkle of that until it infiltrated the whole life. It’s impossible for us to try and sift out the yeast once it’s been mixed into the dough. But what is impossible to us is possible with God! He can turn it around. He’s a potter. He can remake us. Maybe today, you feel overwhelmed by the mess in your life. It exploded! Or maybe you’re like that deer. You’ve been warned. You’re in a frozen position–run! Don’t drop your head and go back to mindless grazing. The hunter is coming for you. Wherever you are today, you can change. Don’t let the little things become big. God has a great plan for you! Forward Challenge: Make time to let God run the little foxes from your life and to remove any leaven that might be spoiling all He has for you. What are some ways we can prevent little foxes from getting inside the vineyard? How can we guard against subtle things seeping into our daily lives? Can you create an atmospher of faith? I’m talking about that today on Thoughts On Plot. You don’t have to be a writer to create this kind of atmosphere. When we constantly tell ourselves we can’t do something, when we let every negative word said about us rule our thoughts, we’ll never succeed. We may never even try. Maybe you’re about to throw in the towel today. Maybe you’ve given up on a dream because someone (or so many) has told you it can never be done–at least not by you. Maybe you’re in a state of paralyzing fear and can’t move forward, even a baby step. It’s time to create an atmosphere of faith. Now, come by Thoughts On Plot and see what creating an atmosphere faith can look like. You still have time to enter and win Falling For Texas a contemporary romance by Jill Lynn. Click HERE to enter. Have you subscribed to my newsletter, The Patched In? There’s only a short time left to receive my FREE Christmas novella before the offer ends. Also, a sneak peek of my new novella is coming to those are patched in this week! So join now! CLICK HERE. You immediately thought money, didn’t you? You know you did. I’ve kept it short you so you can have a couple minutes to worship before moving on to your next blog post! I love this song by Kari Jobe. I love the lyrics even more. 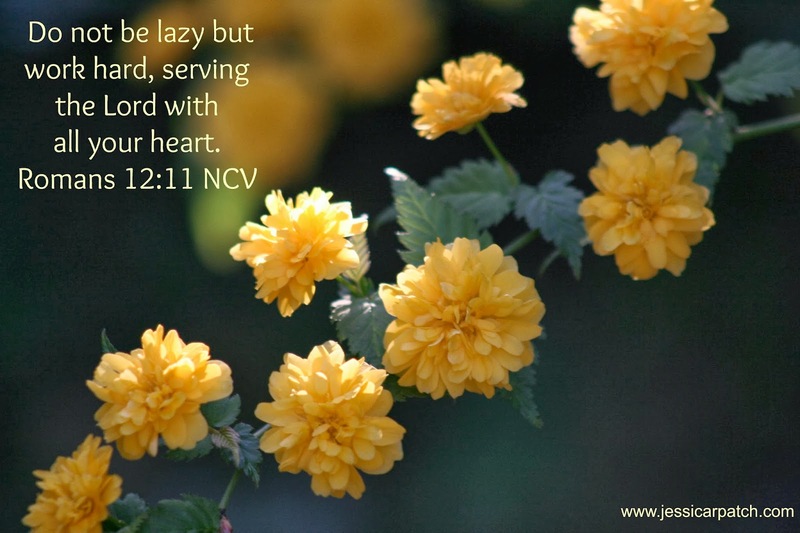 Do you ever find yourself lagging in serving the Lord? Why do you think we lose our zeal? How do you think we can rekindle the fiery passion that used to burn? The video below hints at our lesson on Wednesday and how to serve with zeal, not lagging. 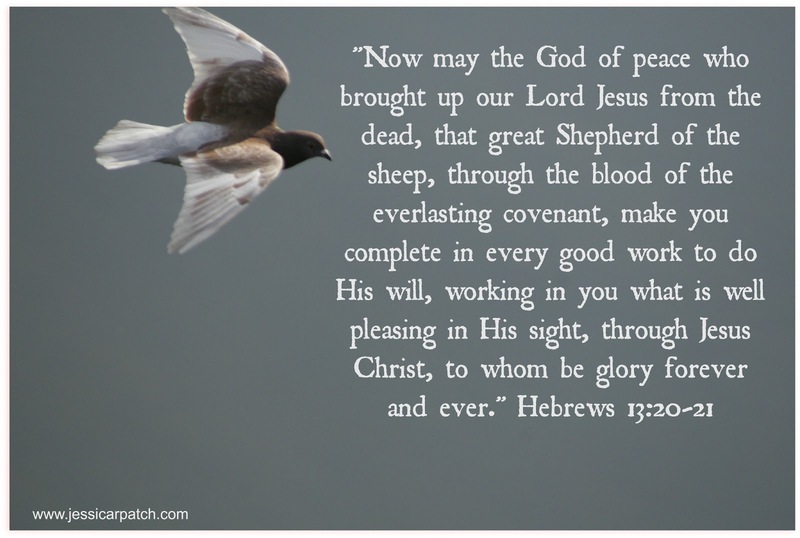 Musing on Hebrews 13:20-21 God of Peace and Power! I think it’s a right-off-the-bat reminder that the God of peace is working and if he’s our God, then he’s also our peace. No matter what what questions we have or statements we declare. I wasn’t sure what I was going to blog about this week until my good friend, Melissa Tagg wrote a guest post about Leviticus on Jenny Hale’s blog. So join me Wednesday, don’t be scared!, while we dive into Leviticus and the peace offering and what significance it has on us today. I promise to guide you to some fascinating treasure pulled from what some might consider dry places (including myself once upon a time). Musing/Meditation Prompt: The God of all peace…are you at peace right now? Why or why not. Think on the amazing power it took to raise our Lord Jesus from the dead! That same power resides in you? Think of that everlasting covenant. You belong to him! Forever. God has marvelous plans for you. Think of occasions when you fulfilled some of those plans. Trust God today with them. What would you say robs you of peace most quickly? What is one thing you can do today to change that? Posted in UncategorizedTagged #devotions, faith, Hebrews 13:20-21, joy 2013, meditation monday, Peace8 Comments on Musing on Hebrews 13:20-21 God of Peace and Power!